8036 ft (2449 m) . 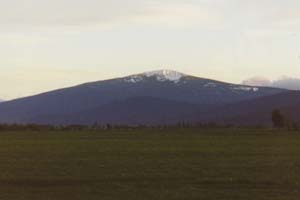 Many volcanoes in the Cascade Range have been completely overlooked by the general public, and Pelican Butte is one of them. Perhaps this is because its broad shield is less spectacular than the striking cone of nearby Mount McLoughlin. 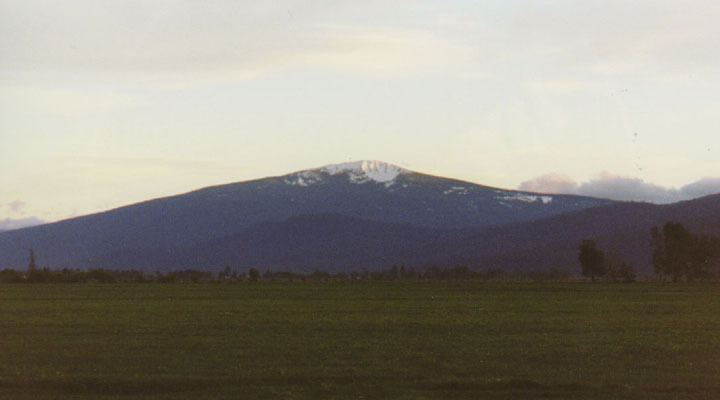 Nevertheless, Pelican Butte is the more voluminous of the two volcanoes, and despite its squat form, it rises an impressive 3800 ft (1150 m) above the Klamath Basin. 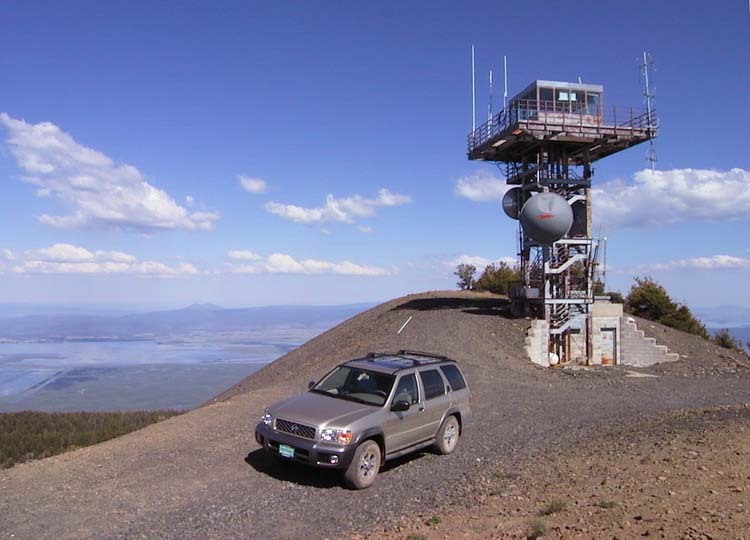 Views from the summit, reachable in summer by a 4WD road, are exceptional, spanning the southern Cascades and the entire Klamath Basin. A pair of large Ice Age glacial cirques on the northeast side mar the otherwise near-perfect symmetry of the shield, and it is these steep bowls which hold the most interest for skiers. 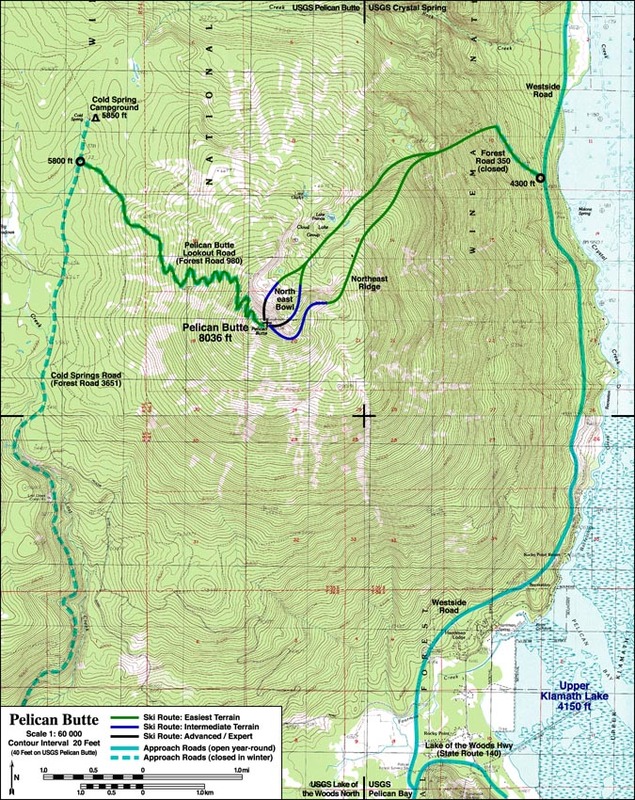 Since the 1960's there have been a number of proposals from Klamath Falls locals for construction of a ski area on the northeast flanks, with lifts stretching from the summit all the way down to the shore of Upper Klamath Lake, and one of the proposals is still under review by the Forest Service (see links below). Although the proposal is likely to be defeated on a number of environmental technicalities despite overwhelming local support, in this case a ski area might possibly be an improvement, since currently the area is given over to snowmobilers during the winter months. For backcountry skiers, the steep gullies and broad open slopes of the Northeast Bowls should be a tempting goal now, regardless of the fate of the ski area. In winter, access would be easiest from the Westside Road along Upper Klamath Lake, while in spring as the logging roads melt out the snowmobilers would disappear and access to the bowls via the summit road would become ideal. Pelican Butte receives over 400 inches of snowfall annually, and large amounts typically linger in the Northeast Bowls into July. (16 km) The Northeast Bowls offer a variety of skiable lines, ranging in difficulty from expert straight down the 35-degree gullies to intermediate along the rim of the bowls. The vertical drop is about 1500 ft from the summit to the bottom of the cirque near Lake Francis, with much gentler terrain in the forest below. 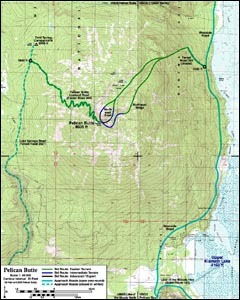 Access from the Westside Road starts from Malone Spring and follows old logging roads and trails up the east flank to the summit, although these are no longer shown on Forest Service maps. 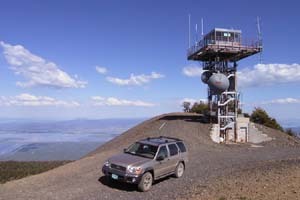 Access to the western flank begins with 9.5 miles of good gravel road (FSR 3651) from Highway 140, leading to the Pelican Butte road which services a lookout tower on the summit. These final 4.5 miles (above 6000 ft) are passable only to high-clearance 4WD vehicles. In spring, those with suitable vehicles could attempt to drive the summit road to snowline, although it is narrow and turning around would be difficult. Others should simply park beside the gravel road and hike the melted out sections of the summit road until snowline is reached. The short approach makes it feasible to yo-yo several runs in the Northeast Bowls.